An understanding of what we mean by the present is one of the key issues in literature, philosophy, and culture today, but also one of the most neglected and misunderstood. 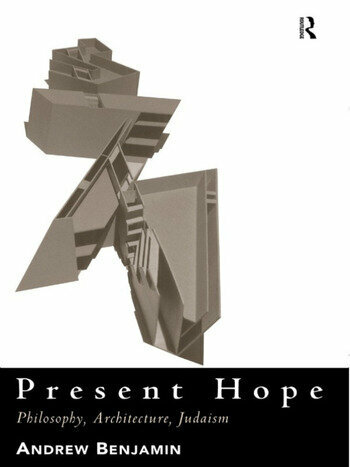 Present Hope develops a fascinating philosophical understanding of the present, approaching this question via discussions of the nature of historical time, the philosophy of history, memory, and the role of tragedy. Andrew Benjamin shows how we misleadingly view the present as simply a product of chronological time, ignoring the role of history and memory. Accordingly, discussion of what is meant by the present disappears from philosophical concern. To draw attention to this absence, Andrew Benjamin introduces the notion of hope and asks what this concept can tell us about the present. At the heart of the outstanding work is an emphasis on the relation between hope and the Jewish tradition. Through discussions of philosophical responses to the Holocaust, the work of Walter Benjamin, Daniel Libeskind's Jewish Museum, and the poetry of Paul Celan, Present Hope shows how we must look beyond the purely philosophical horizon to understand the present we live in.